Z2 Squids Online Sport Fishing Tackle Store Featuring Artificial Squid Lures From SquidPro Tackle. Our brands include, FAT Squids, Z2 Squids, Squiddy Squids, Hard Head Squids, mini FAT Squids and Floochies. 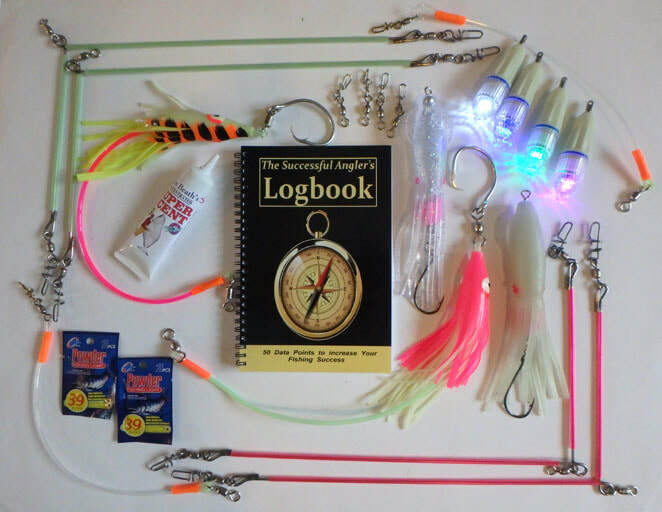 Complete fishing package ready to set one to 4 people up for halibut fishing. 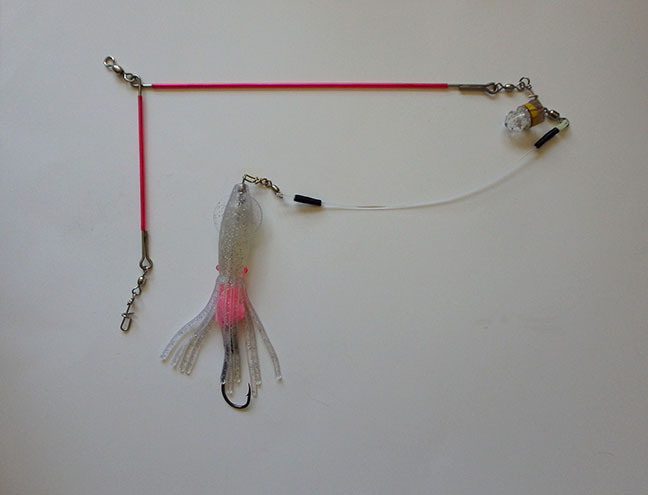 Everything you'll need to make 4 complete rigs with spreader bar and light to catch lots of halibut. Includes 4 battery operated Trophy Torches, one each white, blue, green, and UV (batteries not included). 4 high-vis spreader bars - 2 UV and 2 glow. 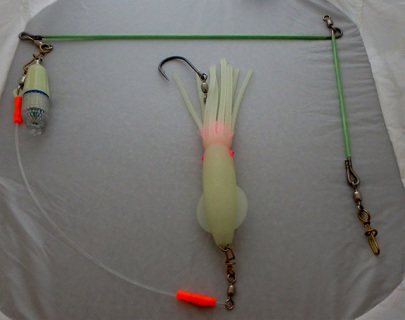 2 fully rigged Z2 squids - one triple glow and one UV. 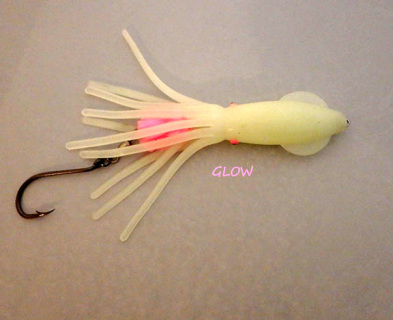 2 Brite Bite OctoSquid leaders with scent tube - one glow/glow pink and one UV/glow prawn. 1 tube super scent paste. 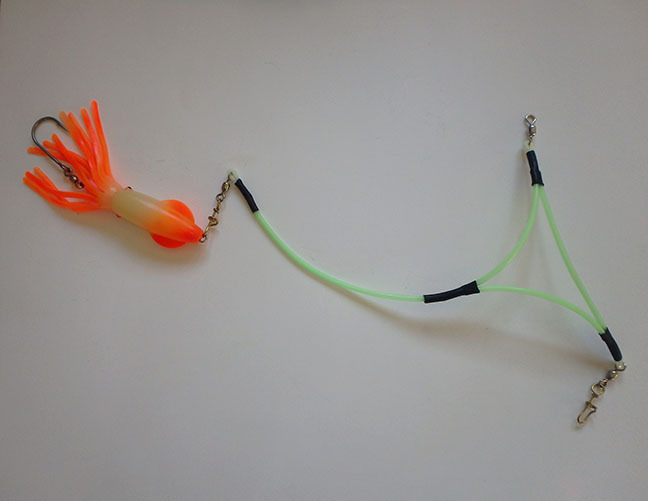 Two squid leaders made from 500 pound test monofilament line. 2 packages light sticks - put a light inside the scent tube to light up the OctoSquid leaders from within, 4 medium corkscrew swivels for your weights, and an Angler's Log Book to chart your successes and discover your prime fishing spots. Save more than $40 over buying these items separately. 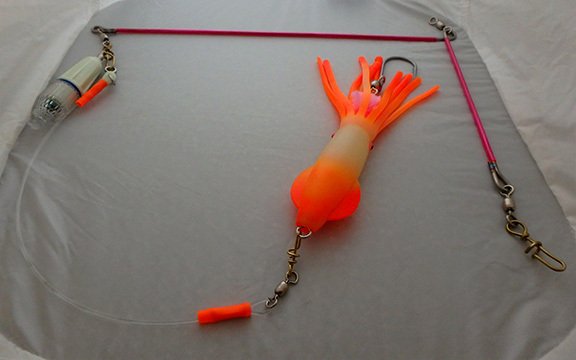 9-inch soft bodied squid fully rigged with 9/0 siwash hook with swivel, stainless leader and yarn ball for scent. Click product photo for larger image. 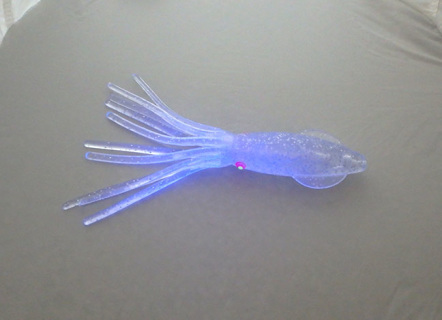 9-inch Z2 Squid in Glow with 9/0 stainless hook, scent yarn ball & stainless steel leader. 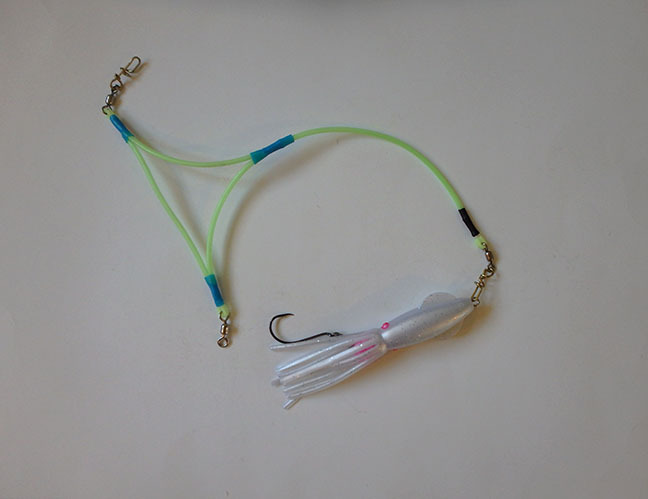 Excellent for halibut, lingcod, rockfish, tuna, dorado, yellowtail, jacks, marlin, sailfish & most other saltwater sport fish. 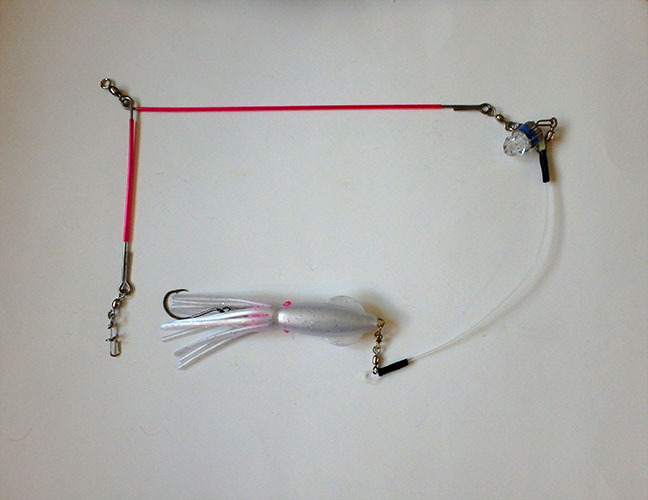 9-inch Z2 Squid in UV with 9/0 stainless hook, scent yarn ball & stainless steel leader. 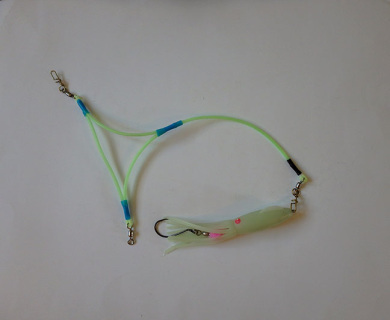 Excellent for halibut, lingcod, rockfish, tuna, dorado, yellowtail, jacks, marlin, sailfish & most other saltwater sport fish. 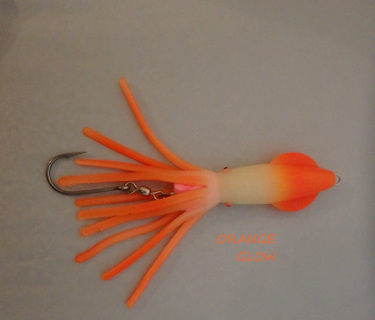 9-inch Z2 Squid in Glow/Orange with 9/0 stainless hook, scent yarn ball & stainless steel leader. Excellent for halibut, lingcod, rockfish, tuna, dorado, yellowtail, jacks, marlin, sailfish & most other saltwater sport fish. 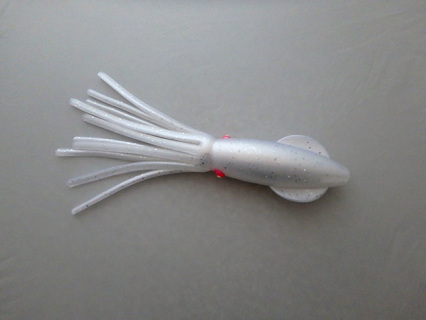 9-inch Z2 Squid in natural color with 9/0 stainless hook, scent yarn ball & stainless steel leader. Excellent for halibut, lingcod, rockfish, tuna, dorado, yellowtail, jacks, marlin, sailfish & most other saltwater sport fish. 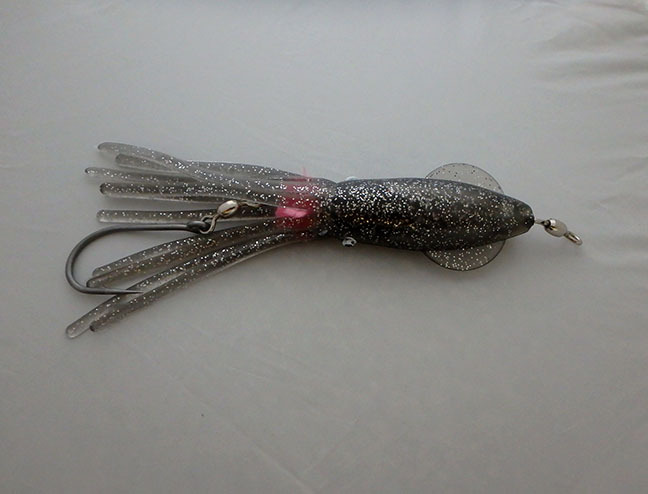 9-inch Z2 Squid in brown and glow color with 9/0 stainless hook, scent yarn ball & stainless steel leader. 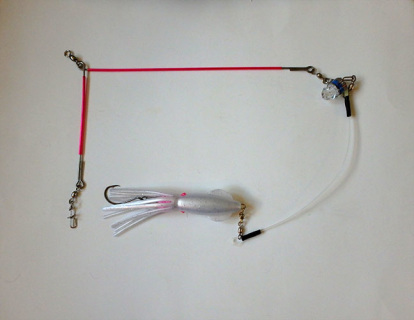 Excellent for halibut, lingcod, rockfish, tuna, dorado, yellowtail, jacks, marlin, sailfish & most other saltwater sport fish. 9 inch long artificial squid lure with stainless leader, swivel, 9/0 J-hook, and yarn scent ball to hold your favorite fish attracting scent. Oil Slick color works great for halibut, ling cod, giant tuna. Dark color creates contrast to help fish find the lure even in deep water. 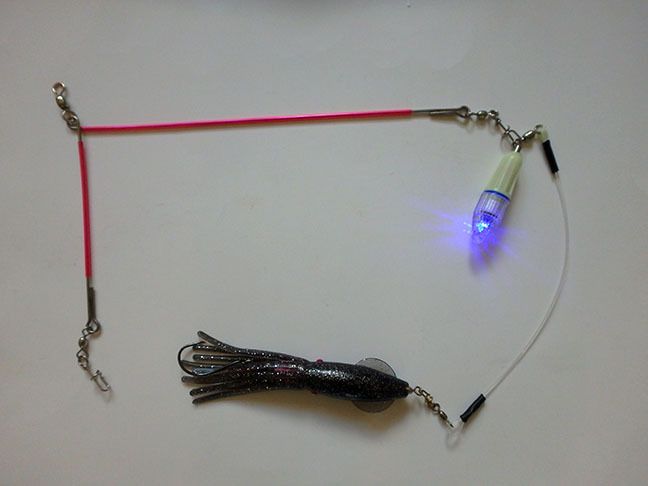 Gray and black lure with sparkles. 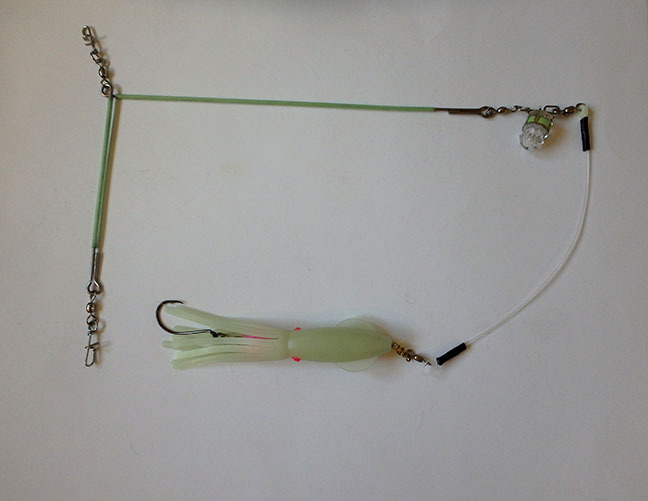 500 pound test leader with medium corkscrew swivel on one end for squid and 6/0 crane swivel on the other end for line. Excellent for use with spreader bars. 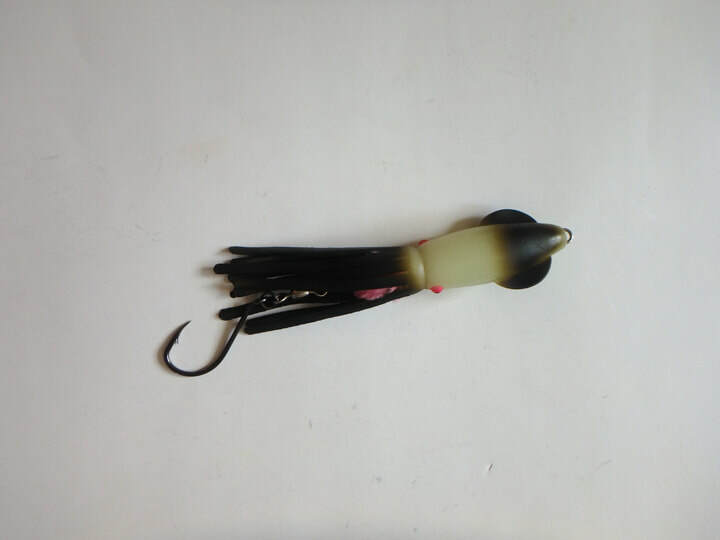 Z2 Squid ready to go on 500 pound test leader. Great for using on spreader bars. 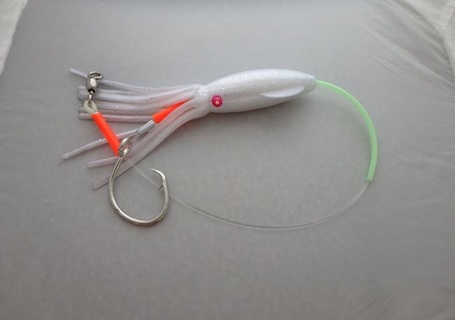 Z2 squid on 500 pound test leader with 16/0 circle hook, swivel, and glow tubing. 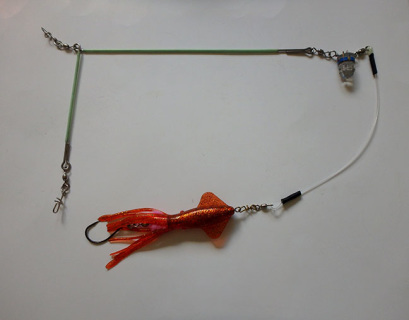 Leader is about 26 inches long from swivel to hook. UV monospreader leader handmade in the USA from 500 pound test line. Corkscrew swivel allows for quick and easy squid changes. Comes with fully rigged pink glow 9 inch Z2 Squid with J-hook. Leader has swivel for line and corkscrew swivel for attaching weight. UV monospreader leader handmade in the USA from 500 pound test line. 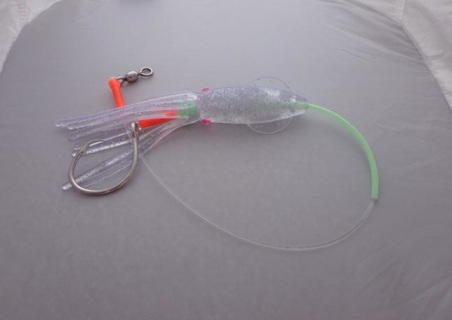 Corkscrew swivel allows for quick and easy squid changes. 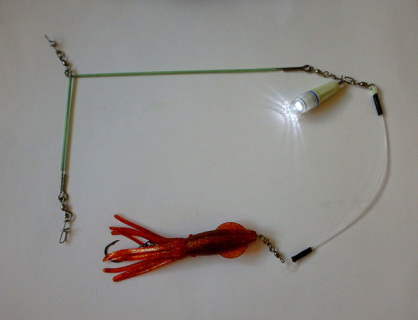 Comes with fully rigged UV 9 inch Z2 Squid with J-hook. Leader has swivel for line and corkscrew swivel for attaching weight. UV monospreader leader handmade in the USA from 500 pound test line. Corkscrew swivel allows for quick and easy squid changes. Comes with fully rigged natural 9 inch Z2 Squid with J-hook. Leader has swivel for line and corkscrew swivel for attaching weight. 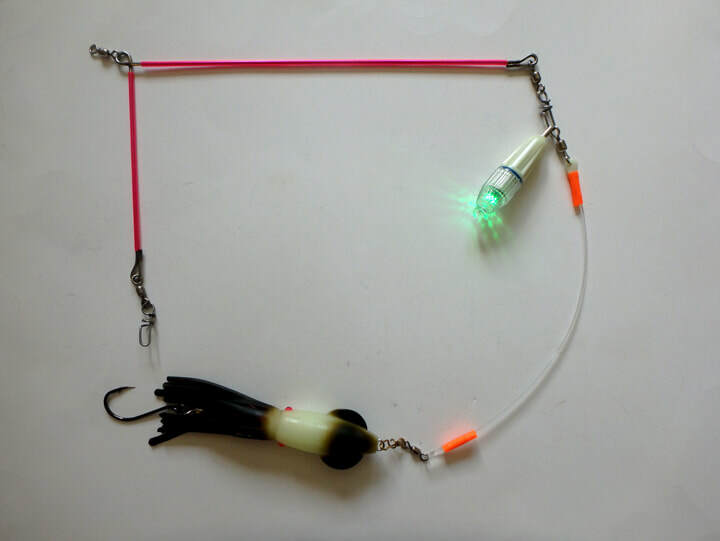 Glow monospreader leader handmade in the USA from 500 pound test line. 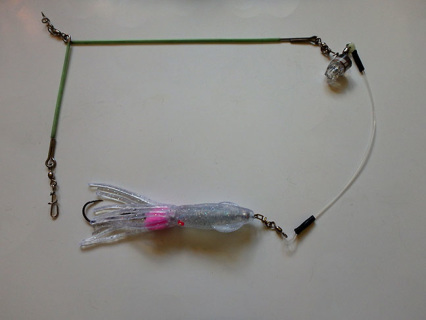 Corkscrew swivel allows for quick and easy squid changes. Comes with fully rigged orange glow 9 inch Z2 Squid with J-hook. Leader has swivel for line and corkscrew swivel for attaching weight. 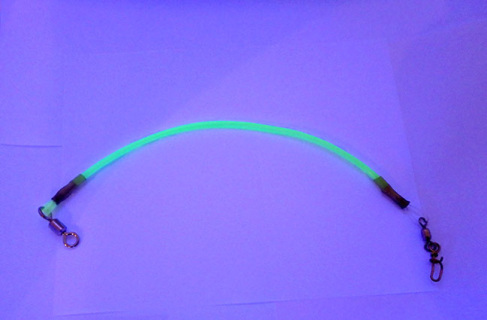 Glow monospreader leader handmade in the USA from 500 pound test line. Corkscrew swivel allows for quick and easy squid changes. Comes with fully rigged glow 9 inch Z2 Squid with J-hook. Leader has swivel for line and corkscrew swivel for attaching weight. 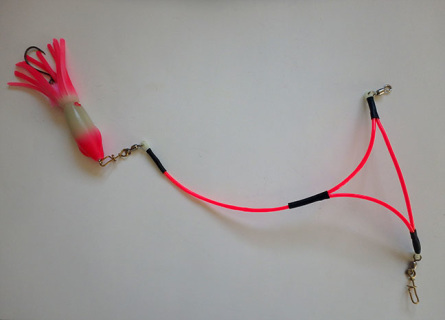 Glow monospreader leader handmade in the USA from 500 pound test line. 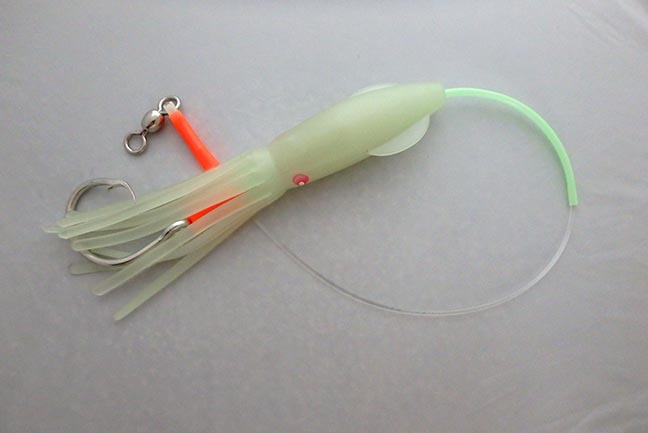 Corkscrew swivel allows for quick and easy squid changes. 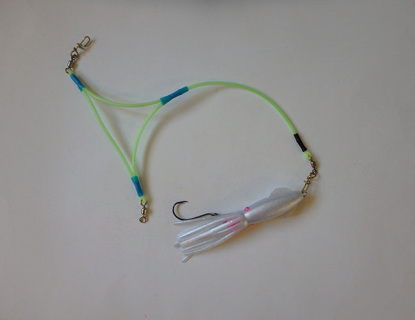 Comes with fully rigged white UV 9 inch Z2 Squid with J-hook. Leader has swivel for line and corkscrew swivel for attaching weight. 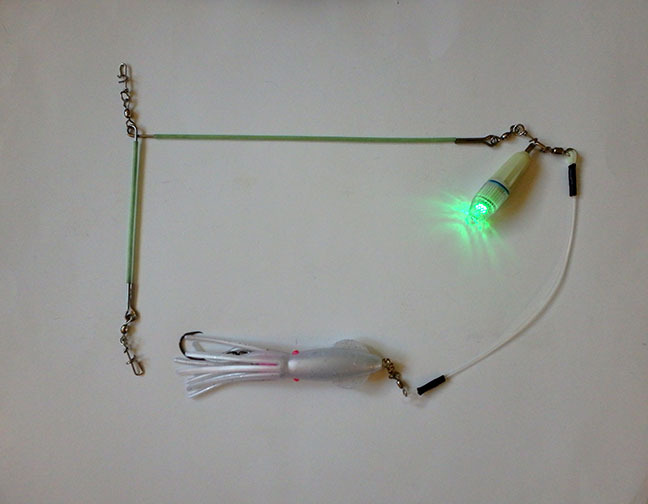 Glow monospreader leader handmade in the USA from 500 pound test line. Corkscrew swivel allows for quick and easy squid changes. 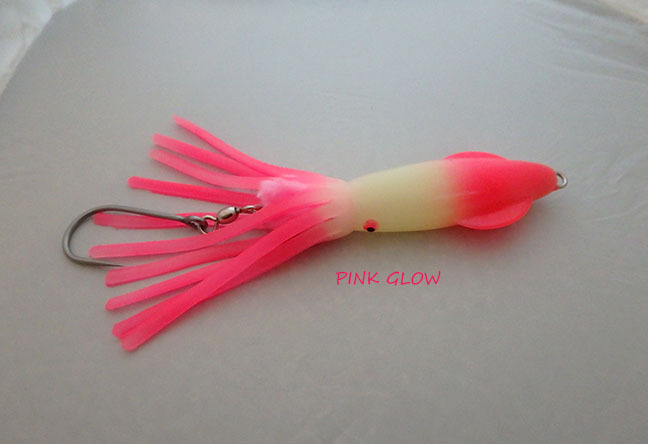 Comes with fully rigged root beer glow color 9 inch Z2 Squid with J-hook. Leader has swivel for line and corkscrew swivel for attaching weight. Glow monospreader leader handmade in the USA from 500 pound test line. Corkscrew swivel allows for quick and easy squid changes. 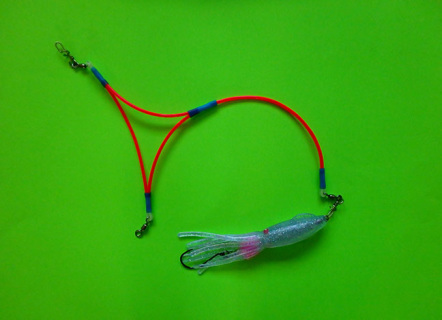 Comes with fully rigged oil slick color 9 inch Z2 Squid with J-hook. Leader has swivel for line and corkscrew swivel for attaching weight. 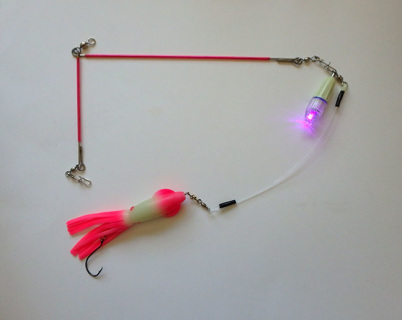 All tackle is connected to the spreader by corkscrew swivels so it's easy to exchange lights and lures. There's also a corkscrew swivel for your weight. Trophy torch uses one AA battery, not included. All tackle is connected to the spreader by corkscrew swivels so it's easy to exchange lights and lures. There's also a corkscrew swivel for your weight. Trophy torch uses one AA battery, not included. Blue brightly lights up UV tackle in the dark and charges up the glow in the squid. Add your own hooks and rigging to customize these unrigged squids. Customize this 9-inch unrigged Z2 Squid in glow color with your own hook and leader. Excellent for halibut, lingcod, rockfish, tuna, dorado, yellowtail, jacks, marlin, sailfish & most other saltwater sport fish. Customize this 9-inch unrigged Z2 Squid in UV color with your own hook and leader. 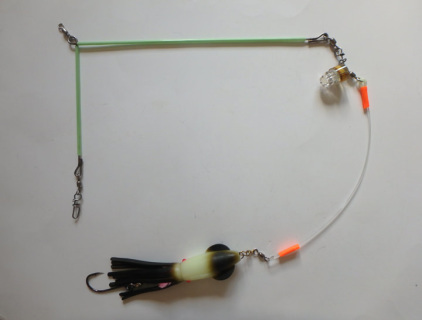 Excellent for halibut, lingcod, rockfish, tuna, dorado, yellowtail, jacks, marlin, sailfish & most other saltwater sport fish. Customize this 9-inch unrigged Z2 Squid in UV white color with your own hook and leader. Excellent for halibut, lingcod, rockfish, tuna, dorado, yellowtail, jacks, marlin, sailfish & most other saltwater sport fish. 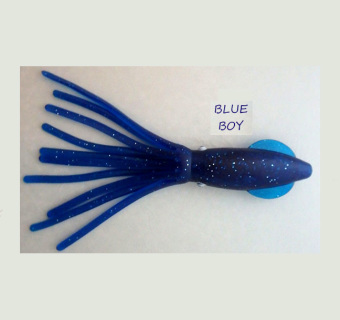 Customize this 9-inch unrigged Z2 Squid in blue boy color with your own hook and leader. Excellent for halibut, lingcod, rockfish, tuna, dorado, yellowtail, jacks, marlin, sailfish & most other saltwater sport fish. 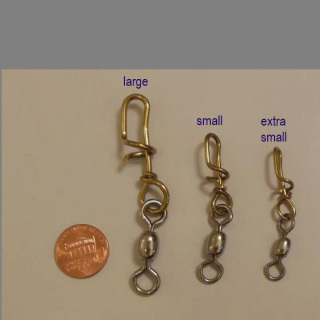 3-Pack large corkscrew swivels for use with big squids. 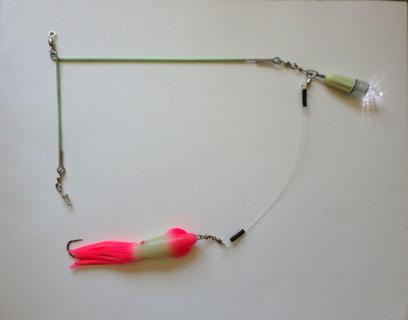 Help keep your lines untangled and make tackle changes easy. Smaller corkscrew swivels available on the squiddy squid page. Two Mini B2 Squids in olive glow color. 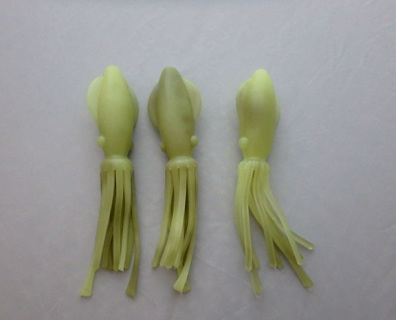 Each squid is 4 1/2 inches long. Customize these little squids with your own hooks and line. Color patterns and shades vary. 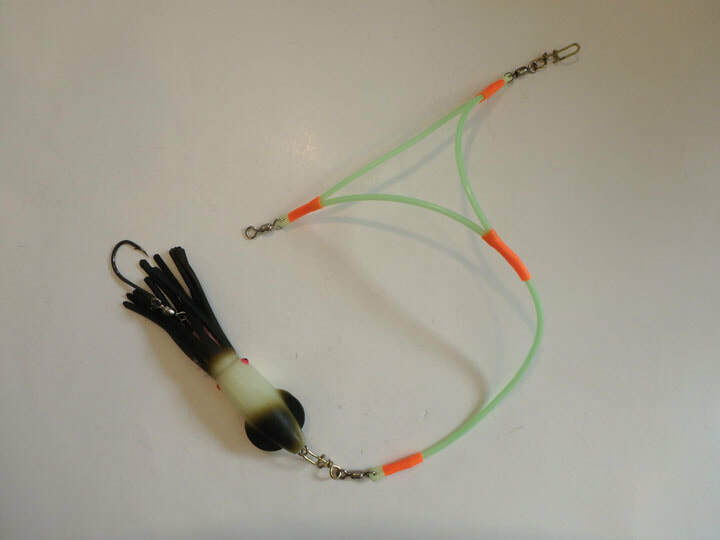 These mini B2 Squids work great for salmon, trout, lingcod, lake trout and a wide variety of other species including Pacific and California halibut. 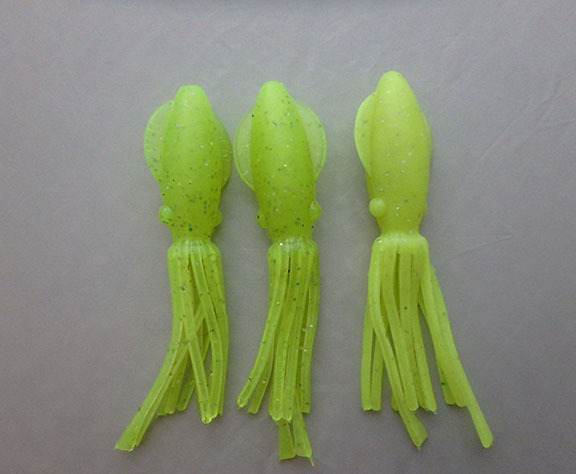 Two Mini B2 Squids in Chartreuse Sparkle glow color. 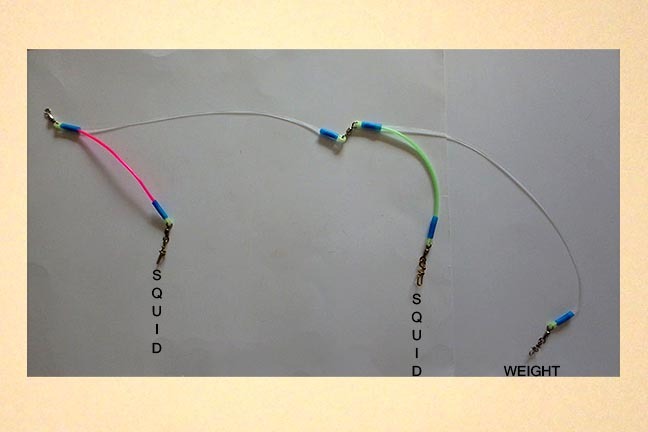 Each squid is 4 1/2 inches long. 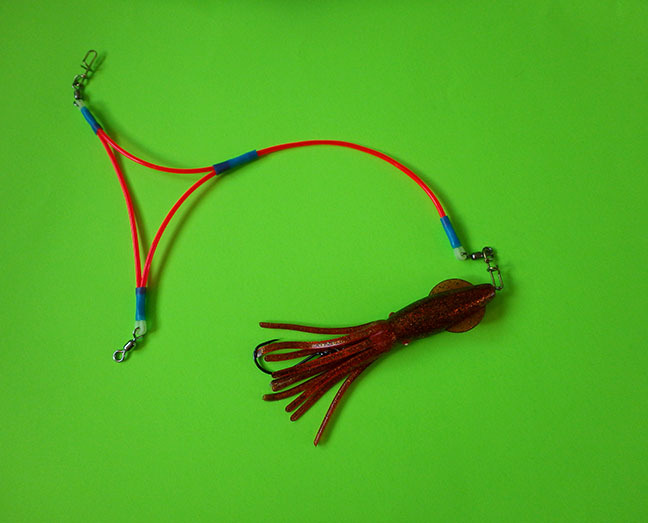 Customize these little squids with your own hooks and line. Color patterns and shades vary. 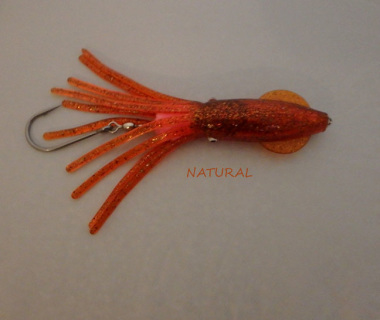 These mini B2 Squids work great for salmon, trout, lingcod, lake trout and a wide variety of other species including Pacific and California halibut. 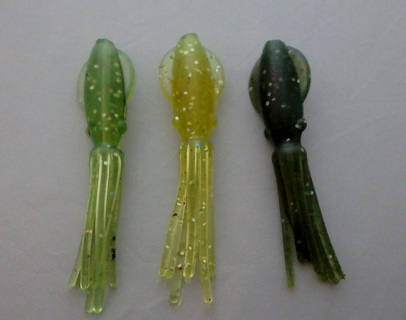 3-Pack Mini B2 Squids in green or yellow colors with sparkles. Each squid is close to 3 inches long. 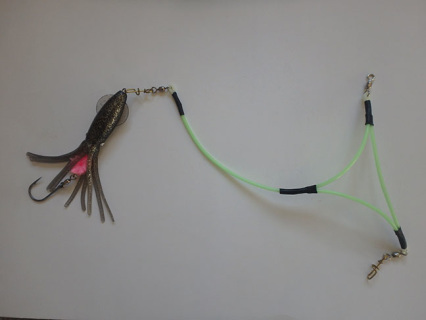 Customize these little squids with your own hooks and line. Colors and shades vary. 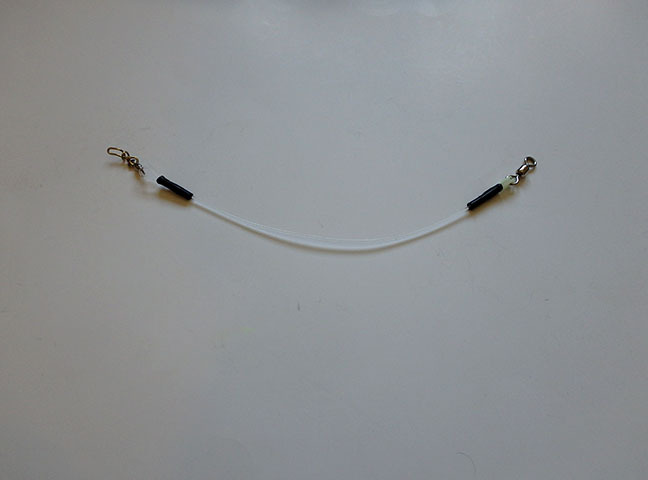 These Tiny B2 Squids work great for salmon, trout, lingcod, lake trout and a wide variety of other species including Pacific and California halibut. 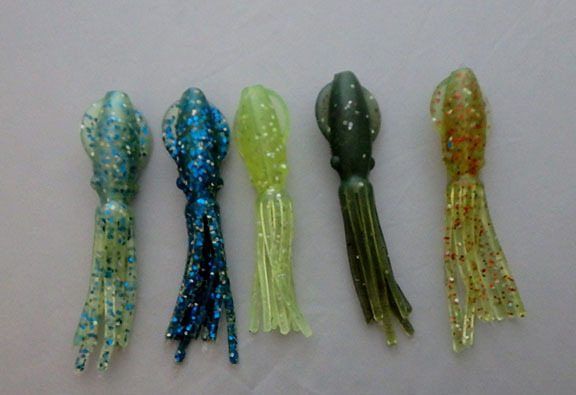 5-Pack Mini B2 Squids in a mix of colors with sparkles. Each squid is close to 3 inches long. Customize these little squids with your own hooks and line. Colors and shades vary. These Tiny B2 Squids work great for salmon, trout, lingcod, lake trout and a wide variety of other species including Pacific and California halibut. Thread this narrow diameter UV tubing through smallunrigged squids and run light line through it to save wear and tear from the line rubbing on the squid so your squids last longer. Catch more fish with each squid! 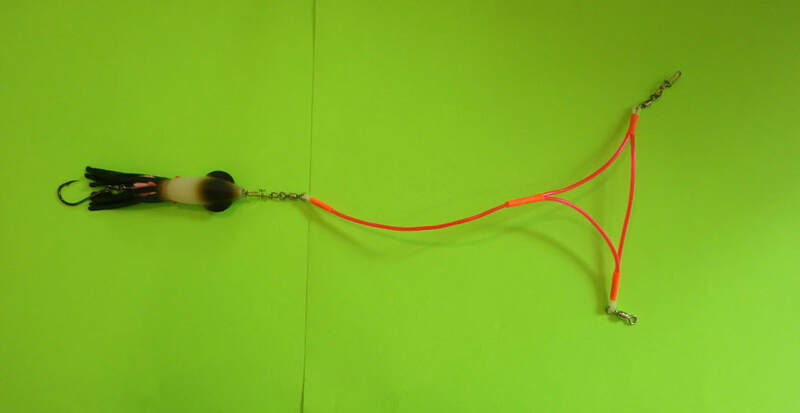 3-foot length of tubing. Excellent for mini fat squids, mini squiddy squids, mini and tiny B2 squids. 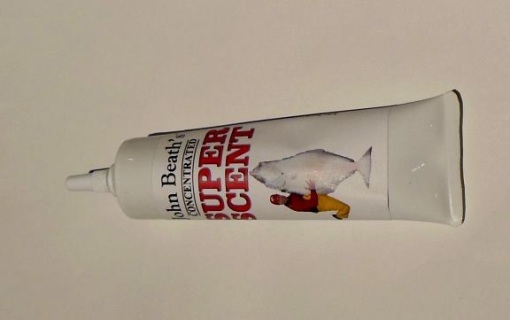 Super Scent paste is made from real baits including, Herring, Squid, Shrimp, Salmon eggs, Crab & Octopus. 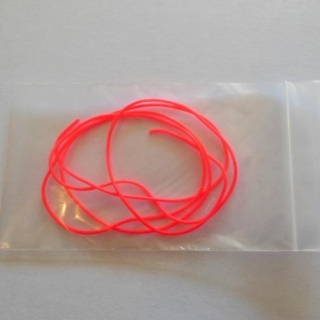 This paste works well on all artificial lures including jigs, plugs, spoons, squids or skirts. Super Scent oil is made from real baits including, Herring, Squid, Shrimp, Salmon eggs, Crab & Octopus. 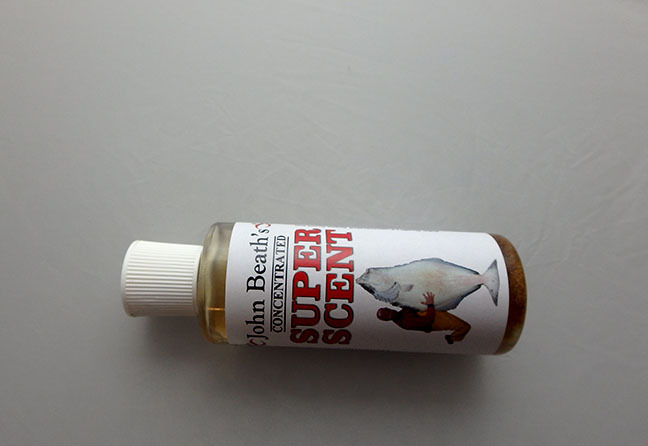 Super Scent oil works well on all baits or lures and can be poured onto the yarn scent ball in the Z2 and fat squids or used in the internal scent chamber of the King Kandy plugs. We accept cards or PayPal. You don't need an account to use your card through PayPal, but you don't have to use PayPal to use your card.